Head of Energia, Vitaly Lopota (Credits: St. Petersburg State National Reseacrh Polytechnic). Head of Russian rocket manufacturer Energia Vitaly Lopota has rejected proposals to create a holding company that would have integrated the leading booster manufacturers Khrunichev and TsSKB Progress. “This proposal would completely eliminate the competitive environment in the country,” stated Lopota. 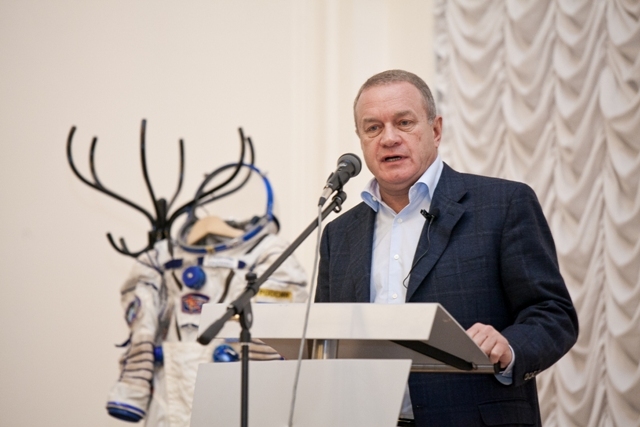 The move had been proposed by high ranking officials in the Russian government in order to introduce unified quality control measures across the Russian space industry in the light of high profile failures. The most recent failure was the Breeze-M booster on December 9th, which had failed in its initial orbital insertion of the Yamal-402 satellite. Luckily the satellite was able to increase its altitude to the correct orbit by using its own thrusters. The same can’t be said for the Russian Express MD2 and Indonesian Telkom-3 satellites, which were launched from Baikonour in August 2012 using the same launch vehicle; both of them failed to reach orbit. “The central issue is how Russia can compete on the international market. Besides, no one can so far answer the question of what is better: a vertically or horizontally integrated company,” said Sergei Barinov , an official from the Russian Federal Property Management Agency. Given that over 40% of the world’s launches are performed using Russian technology, it is understandable that Russia would want to keep a competitive edge. It seems that the government is quite insistent that changes be made to practices and processes in the Russian launch industry, so this rejection from Energia’s chief appears to be a hurdle. However, talks are continuing between Roscosmos, Energia, and governmental departments, as they try to determine the best way forward whilst maintaining quality and competitiveness.